Small and historic rock gym, a bit 'greasy, but re-bolted to taps resin, often not far from the mountain guides of the Promont Association. It is located along the trail that leads from Crevenna to Capanna Mara. Difficult modest and climbing in plaque, make the Sasso, only on the southern side, interesting and suitable for beginners. The North side has some difficult shots, made even more insidious because greasy. 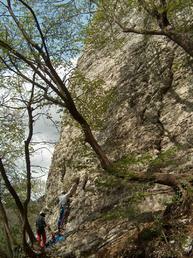 We recommend a 70-meter rope for double shots of the southern slope. Access: From the center of Erba go up to the Hospital, then right towards Via Fatebenefratelli. After a few hundred meters, before the Hospital, turn left into Via Clerici and follow it all the way, until the Church of Crevenna, where, continuing along Via Monti, you pass under the SP Arosio-Canzo.Now on Via San Giorgio, towards right past the cemetery, where you park (During the week it is possible to go to the Hermitage in the car and park there). Follow the dirt road that goes up to the Hermitage of San Salvatore, where you take a wide mule track to the left of the parking lot hedge. Continue, ignoring the detours for the other Sassi (Yellow and Edera), for about 15 minutes, and after a hairpin turn right to get to the structure. Rock: Gray limestone with intrusions typical of the area.